The Dillard's store at Valle Vista mall will soon be transformed into a clearance center. It will be the fourth Dillard's clearance center in Texas. HARLINGEN — Valle Vista mall anchor tenant Dillard’s has announced it will convert the department store here to a clearance store. Clearance stores are locations where large retail companies like Dillard’s send items they have overstocked and sell them at vastly reduced prices. It also means the clearance store won’t have the full range of products or sizes available at other Dillard’s locations. Dillard’s has 57 locations in Texas and just three of them — Ridgman Mall in Fort Worth, Irving Mall in Irving and West Oaks in Houston — are clearance stores. The sign then listed the locations of Dillard’s stores in McAllen and Brownsville. It is unclear if the Dillard’s decision for its Harlingen store will mean some staff lose their jobs or was based in whole or part on the recent history of the troubled mall. 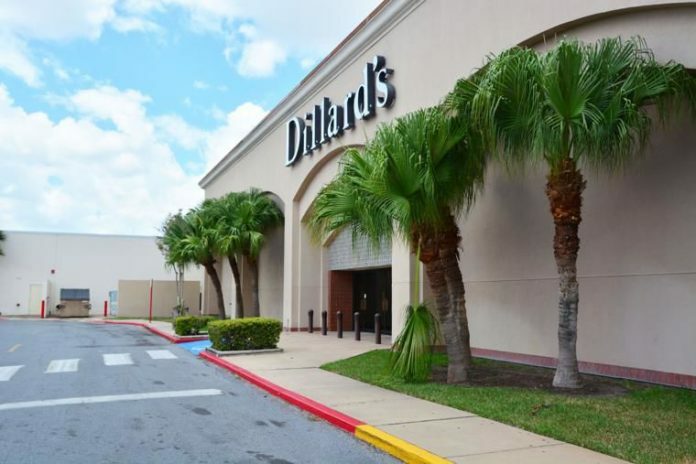 A Dillard’s spokesperson did not answer emails or phone calls seeking answers about whether the mall’s financial problems were a factor in the decision and whether it indicated the community was not supporting the current store financially. Last year the owners of the city’s premier mall, Washington Prime Group, relinquished the property back to lenders, conceding profits from Valle Vista had not met expectations. Since then it has been managed by ProEquity Asset Management Corp.
An auction of the property was held in May, but there has been no announcement of any purchaser buying the distressed property. Indications of the mall’s financial problems began to become public in 2016. The health of malls like Valle Vista is determined by what is called a debt-to-yield ratio. That is a formula for net operating income of a mall or other property divided by mortgage debt times 100. In 2016, Valle Vista’s debt yield ratio was 9.0 percent, which is generally regarded as acceptable in a primary market but seen as an underperformer in a smaller market like Harlingen. Washington Prime Group included Valle Vista with four other malls it owns in Iowa, Virginia, Florida and Ohio as being underperforming, according to a Morningstar report in February 2016. Phones at Valle Vista’s management office were not answered MOnday.